I can't even try to imagine their situation but I'm almost jealous of them. Their complete use of the land, building houses with palm frond roofs. Their rituals, painting their body red with annatto shrub seeds. Their world, honoring their ancestors just by living like them. It's simple, and maybe at times inconvenient, but it's also peaceful and natural. Sure, maybe they're not advancing but they live. What are they thinking about as the overhead plane flies past them? 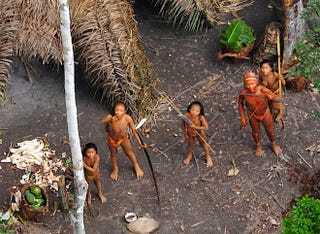 It doesn't look like they're hostile, other pictures of uncontacted tribes show bow & arrows pointed directly at the plane. This picture catches them stunned, mouth agape, curiously pointing. Like you caught them acting, only they're not acting. I can't quite explain it, it's not exactly confusion on their faces but rather an interrupted moment mixed with a little bit of incredulity. So very amazing, nonetheless. "[It's] necessary to reaffirm that these peoples exist, so we support the use of images that prove these facts. These peoples have had their most fundamental rights, particularly their right to life, ignored … it is therefore crucial that we protect them." Update: Some of you may have recognized a similar story in 2008 which was wrongfully called a hoax. It wasn't. Various publications apologized for calling it a hoax and retracted their posts. These new pictures (and additional footage) will also be featured in an upcoming episode of Human Planet, called 'Jungles', on BBC.